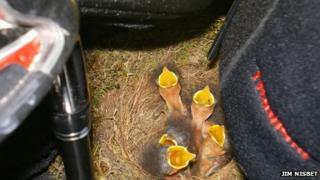 A golfer more accustomed to bagging birdies on the course has found a robin's nest among his clubs. Jim Nisbet, from Burnside in South Lanarkshire, opened an old golf bag in his garage and discovered a robin had laid five eggs in the snug nest. Mr Nisbet left the clever hideaway undisturbed for several weeks. When he checked the bag again, it had become the home of a healthy brood of five robin chicks. Mr Nisbet, a member of RSPB Scotland, said: "Over the last few years a robin has visited the garage and nested, but this year the choice of my spare golf bag was a rather unexpected site. "Once I had found the nest complete with the robin and discovered that there were five eggs, I tried not to disturb but took the chance of the photos. "It was quite rewarding to follow the progress from the nest building through to the hatching of the eggs and then the developing chicks. "I am anticipating the robin's presence, as usual, when some gardening is being done and we reveal some food in the form of worms. "I hope the golf clubs will help to produce some birdies on the golf course too." Robins are known for sometimes selecting unconventional nesting sites, with RSPB Scotland members previously reporting nests on abandoned bicycles, tool boxes and even kitchen shelves. Leianna Padgett of RSPB Scotland said: "Robins can be inventive when it comes to building a nest, occasionally forgoing the conventional nestbox for a safe and snug site elsewhere. "Providing birds and other garden wildlife with shelter to raise their young, as well as food and water, is a fantastic way to give nature a home on your doorstep."